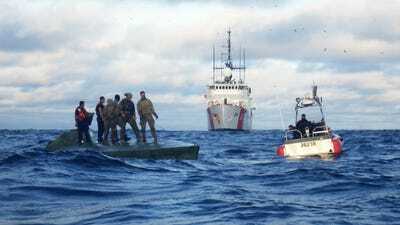 US Coast GuardA US Coast Guardsman in an interceptor boat launched from the Coast Guard cutter Steadfast pursues a suspected smuggling vessel as the suspected smugglers throw bales overboard during a high-speed chase in international waters in the Eastern Pacific Ocean, July 11, 2018. The past three years have seen some of the Coast Guard’s highest cocaine seizures on record. Most of those drugs are intercepted in the eastern Pacific Ocean, where smugglers move drugs from South America to North America. Each Coast Guard interdiction is a multistep process – each one designed to mitigate risks. 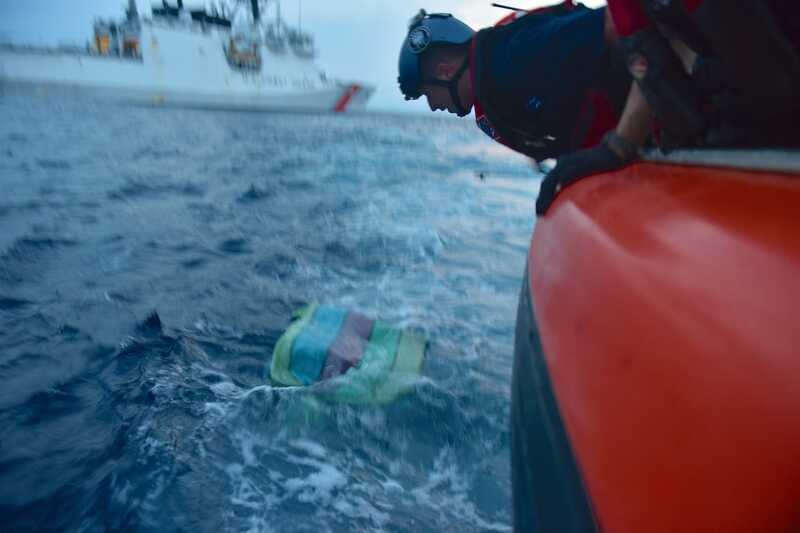 FT. LAUDERDALE, Florida – The Coast Guard cutter James pulled into Port Everglades on November 15 laden with 38,000 pounds of cocaine hauled in by it and other Coast Guard ships during months of patrols in the eastern Pacific Ocean. The crew of the James and the helicopter deployed with them were in formation behind the bales, some of which were topped with testaments to the precision of Coast Guard marksmen. 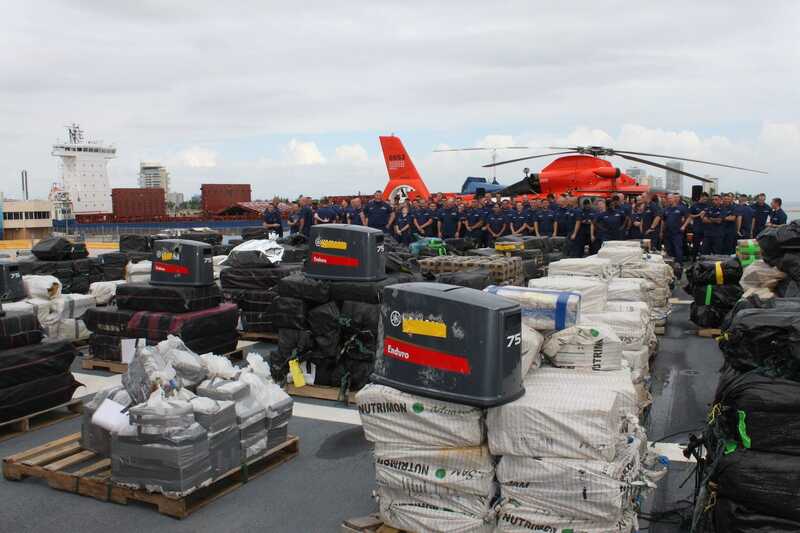 Coast Guard crews and the ships and aircraft they use have a variety of roles, but they are just one component in the fight against drug smuggling on the high seas that is reaching new heights. 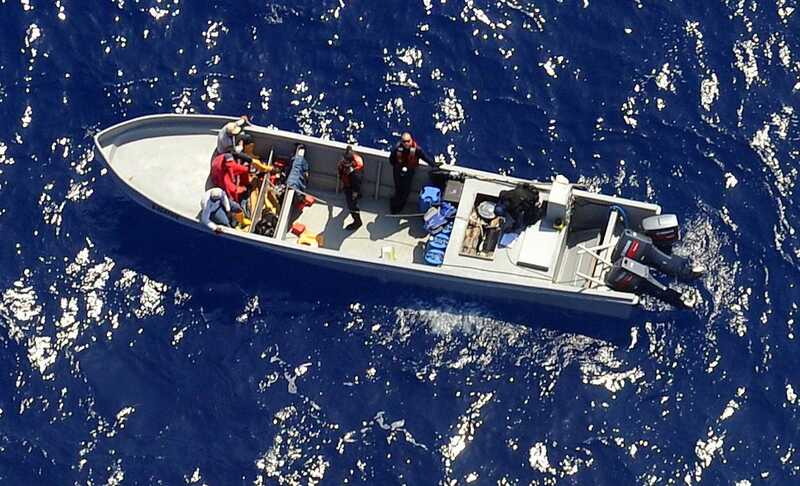 The 458,000 pounds of cocaine seized in the most recent fiscal year, which ended September 30, was intercepted through a complex interdiction process that sometimes begins before the drugs even set sail, draws on governments and security forces from throughout the region, and requires crews to be as good at reacting as they are at planning. 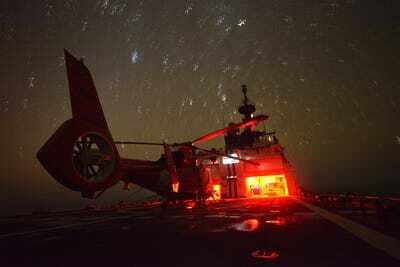 “At-sea interdiction … is truly a team sport,” Coast Guard commandant Adm. Karl Schultz said aboard the James. Christopher Woody/Business InsiderBales of cocaine on display aboard the US Coast Guard cutter James, in front of the ship’s crew and its helicopter, in Ft. Lauderdale, Florida, November 15, 2018. Colombia is the world’s largest producer of coca, the base ingredient in cocaine. While it’s the only South American country with Atlantic and Pacific coasts, more than 80% of the finished product destined for the US goes through the eastern Pacific – an area the size of the US mainland. Finding suspicious vessels in an area that size can be a challenge for the Coast Guard, even with the capabilities of the other US agencies and neighbouring countries with which it partners. US Coast GuardA crew from US Coast Guard cutter Dependable intercept a drug-smuggling boat in the eastern Pacific Ocean, April 8, 2017. 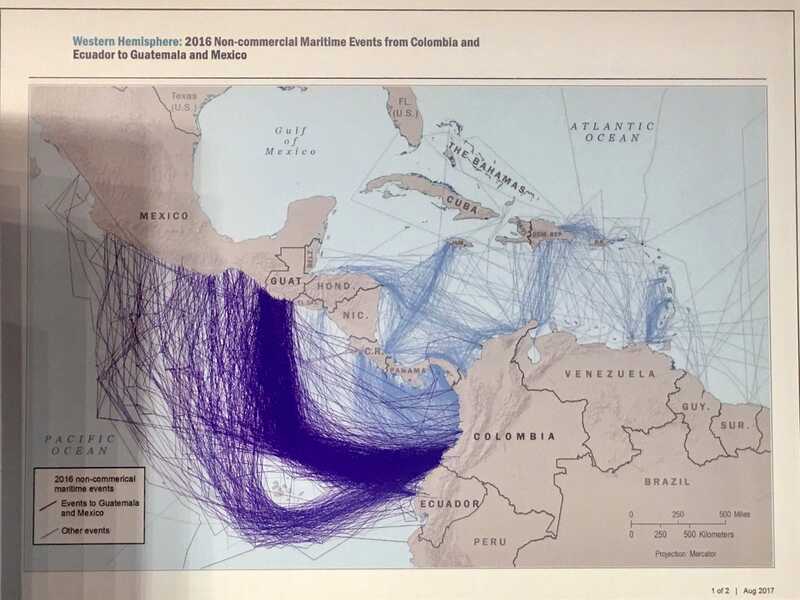 Intelligence-gathering can point to when and where shipments will depart, but in the absence of that the search for seaborne smugglers often starts in at sea, where what a vessel looks like and how people aboard it behave are sometimes the first signs of nefarious activity. “If you have like one of these open-construction boats, known as a panga, that usually has multiple outboard engines,” Capt. Jeffrey Randall, commander of the James, told Business Insider in an interview aboard the cutter. 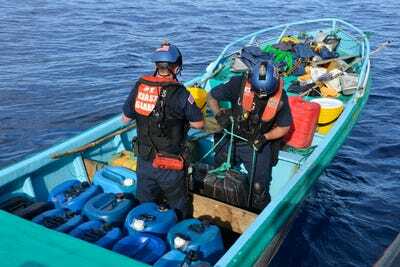 US Coast GuardA crew from US Coast Guard cutter Dependable intercepts a drug-smuggling boat in the eastern Pacific Ocean, April 8,, 2017. In other instances, the crew of vessel not waving or otherwise acknowledging the Coast Guard’s presence – particularly when that presence is a helicopter overhead – may also warrant closer attention. 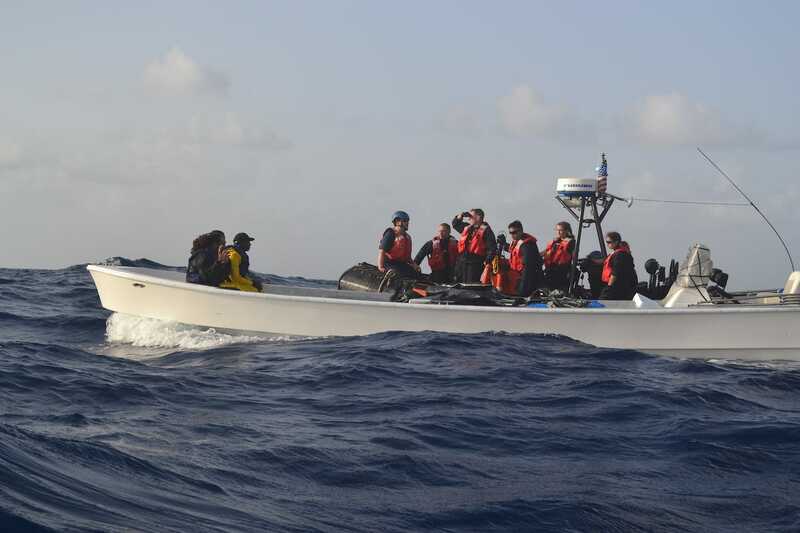 Personnel from the Joint Interagency Task Force South, a US-based multiagency body that liaises with authorities through the region, also run aerial patrols over the Caribbean and Pacific Ocean. US Coast Guard/Petty Officer 1st Class Mark BarneyA boarding team aboard the Coast Guard cutter Stratton removes bales of contraband that later tested positive for cocaine from a go-fast vessel in international waters in the drug-transit zone of the eastern Pacific Ocean, February 23, 2017. But where and when – and even whether – those interdictions take place depends on a number of factors. “It basically boils down to time, speed, and distance, and where you want to effect that interdiction,” Randall said. US Coast Guard/Petty Officer 1st Class Matthew S. MasaschiCoast Guard Cutter Bertholf during a counterdrug patrol in the eastern Pacific Ocean, March 10, 2018. “There’s a time aspect. There’s a boat-capability aspect. There’s a what-is-your-adversary-going-to-do aspect,” Randall said. US Coast Guard/Petty Officer 2nd Class Timothy MidasCrew members from the US Coast Guard cutter Spencer interdict a self-propelled semi-submersible vessel during a counter-narcotics patrol, November 11, 2017. Coast Guard crew members tasked with those interdictions are typically waiting on-call aboard their ship. Poor conditions can cause delays, as can logistical factors. 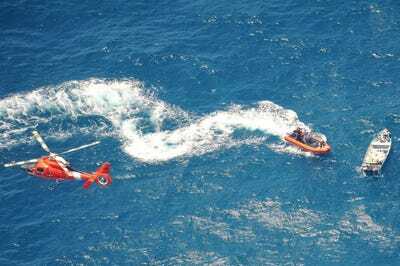 US Coast GuardThe crew of the Coast Guard Cutter Harriet Lane approaches a suspected smuggling vessel while a helicopter crew from the Coast Guard Helicopter Interdiction Tactical Squadron monitors from the air, February 25, 2018. “Our support role is to basically get them on target, get them going at the target, and then monitoring the target to make sure we’re providing the adjustments to them to effect that interdiction,” Randall added, describing the cutter as the “carriage” for the small boats and helicopter. There are different approach tactics for different kinds of vessels, Juul-Hindsgaul said, declining to elaborate on them. And different kinds of missions come with different kinds of concerns, he added. US Coast GuardCoast Guard cutter Valiant crew members transport seized contraband from one of the eight vessels interdicted during their eight-week patrol in the eastern Pacific in early 2016. In the small boat, where Juul-Hindsgaul is always stationed, communications are a constant concern. Approaching a suspect vessel can get hairy. In April, Coast Guard and Navy crews came upon a go-fast boat in the eastern Pacific. Spotting the US ship, the go-fast boat’s crew began throwing their cargo overboard. Then their engine caught fire, and Coast Guardsmen and Navy sailors had to battle flames before seizing a half-ton of cocaine. 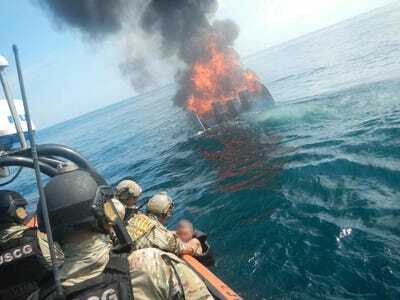 US Coast GuardA suspected smuggler, who jumped from his burning vessel, is pulled aboard an interceptor boat from the USS Zephyr by members of the US Coast Guard and Navy in international waters of the Eastern Pacific Ocean on April 7, 2018. Some at-sea interdictions, which can take 12 hours or more, come up with nothing, either because the suspect vessel carried no contraband or because it offloaded it before being intercepted. Whatever the situation, Coast Guardsman tasked with boarding have to prepare for a variety of potential threats. In one case, a fishing vessel intercepted by the James during its most recent cruise had more than 30 people aboard, Juul-Hindsgual said. US Coast GuardCrewmembers of the Coast Guard Cutter Mohawk (WMEC 913) and Tactical Law Enforcement Team South on top of a self-propelled semi-submersible they stopped July 3, 2018. 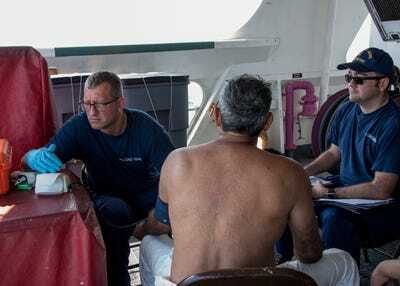 Boarding a suspected smuggling vessel brings a new set of challenges, with a procedure to match. “So we get on board, one of our initial procedures, which you learn out of school, is just your initial safety sweep. You always do that, make sure that the vessel’s safe to be on board,” Juul-Hindsgaul said. Training includes a basic boarding course for officers as well as a specialised counter-narcotics course. Crews keep training while at sea. “We do a lot of training,” Juul-Hindsgaul said. “We find that all the time, that they have scuttling valves or something,” Juul-Hindsgual said. US Coast Guard/Petty Officer 1st Class Jon-Paul RiosA boarding team member from Coast Guard cutter Stratton grabs a bale of cocaine that suspected smugglers jettisoned from their vessel in a failed attempt to flee Coast Guard pursuit in the eastern Pacific Ocean, September 8, 2017. Sometimes smugglers just throw contraband overboard. Recovering floating bales of drugs is no easy task either. Boarding a smuggling vessel means eventually getting off of it – a task complicated by drugs and detainees that need to be brought back. “It matters whether or not the vessel has nationality [and] if it makes a claim of nationality,” Randall said of dealing with a seized vessel. “If it makes a claim of nationality, then we may have to use one of our … bilateral agreements … to do some exchange of information to verify the registry of the vessel or verify the nationality of the people” on it. That inquiry and the response to it often has to go through layers of bureaucracy. It may take hours to get an answer, but that answer affects what comes next, Randall said. 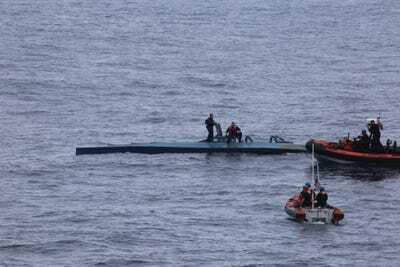 US Coast Guard/Petty Officer 1st Class Jon-Paul RiosCoast Guard cutter Stratton boarding-team members detain four suspected smugglers after intercepting their vessel with 17 bales of cocaine on board in the eastern Pacific Ocean, September 8, 2017. “That’s generally an all-hands effort,” Juul-Hindsgaul said of removing people and contraband. Coast Guardsmen handling any suspected drugs are outfitted with protective gear. 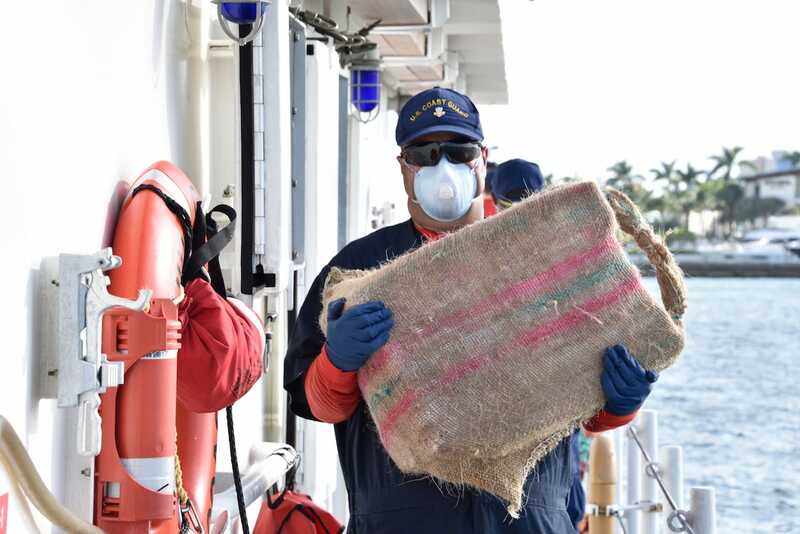 US Coast Guard/Petty Officer 3rd Class Brandon MurrayA Coast Guard cutter Bernard C. Webber crew member carries a bale of cocaine during a drug offload at Coast Guard Base Miami Beach, October 16, 2018. “People train to go through and… check medical and all that sort of stuff for” detainees, Juul-Hindsgual said. “Then we gear up and then transport the contraband to a secure hold” aboard the Coast Guard ship. 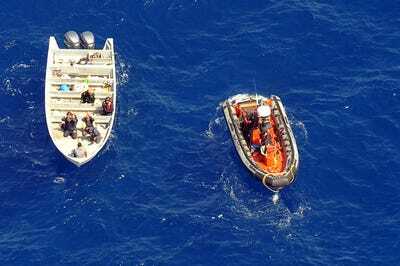 Detainees, some of whom arrive poorly clothed or in ill health, remain at sea with the ship, disembarking to another vessel if the cutter makes a port call in another country, as the Coast Guard must hold them in international waters. “Once we get, basically, to a position where we’re allowed to enforce US law or a country waives jurisdiction … and we get an positive drug test, we will embark the people as detainees and then embark the contraband and then hold them until we can bring them back for US prosecution,” Randall said. Taking care of the drugs is fairly straight-forward process. Seizures from several ships are collected aboard one ship for an offload, usually in South Florida or Southern California. From there, the drugs are usually turned over to the Drug Enforcement Administration, which takes samples and discards the rest. Each year, the DEA’s Cocaine Signature Program conducts tests on about 2,500 cocaine samples. The DEA says its tests can determine the origin of cocaine down to the sub-regional level with 96% confidence, and it consistently finds that Colombian cocaine dominates the US market. US Coast Guard/Petty Officer 1st Class Michael De NysePetty Officer 1st Class Radoslaw Florczak, left, a health services technician aboard Coast Guard cutter Active, medically screens a detained suspected narcotics smuggler during a patrol in the eastern Pacific Ocean, May 15, 2018. Things are more complicated for the human cargo that Coast Guard ships bring back. 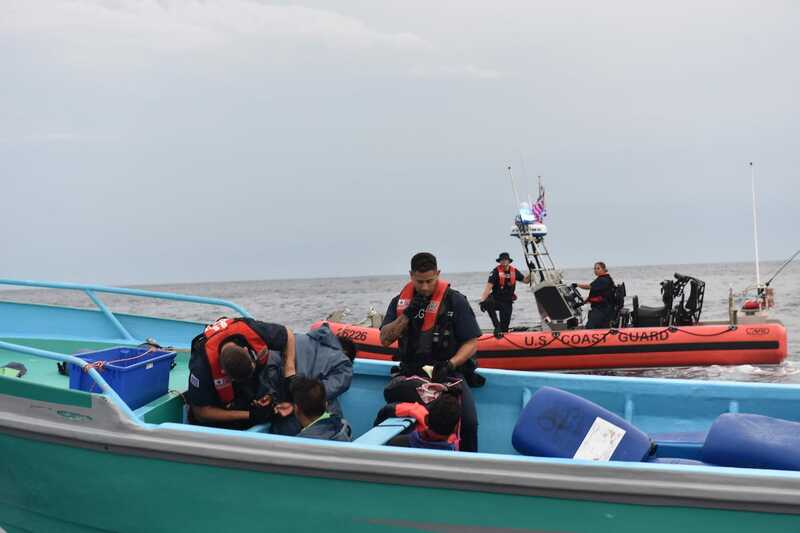 While the Coast Guard is a law-enforcement agency, the expansion of the drug war and of its authority to detain suspected smugglers in international waters has increased the numbers of detainees. That increase has raised concern about legal procedure and due process. 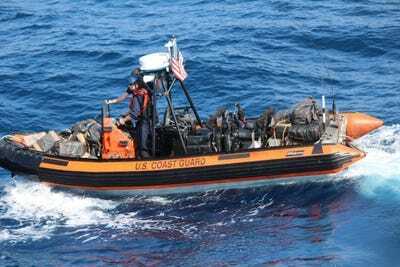 US Coast GuardThe Coast Guard cutter Harriet Lane interdicted a go-fast vessel with 1.1 metric tons of cocaine and three Dominican smugglers in the Caribbean Sea, May 25, 2017. The seized contraband and detainees were transferred to DEA special agents in Puerto Rico, June 2, 2017. Taking care of detainees while aboard and offloading them to the proper authorities were “a challenge of logistics,” he said. 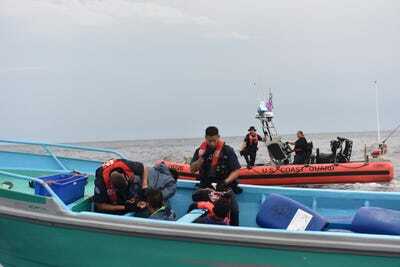 The Coast Guard and US officials have said intelligence gleaned from detainees is vital to bring down trafficking networks, though some are sceptical the smugglers being caught – often low-level members of criminal groups or fishermen who sign up for the lucrative pay a successful smuggling run can bring – can offer more than fragments of information.